I am joining the Indelibles to celebrate indie authors (self-published and small-press) by holding up an example of an outstanding indie work. Like the 25 Indelible authors, I believe amazing works of fiction can be found in indie novels and I want to help you, the reader, make informed choices on your indie purchases. So I bought the Kindle version of Winging It! by Shel Deslisle and took it on vacation with me. First of all, I read Shel’s first book, Dolphin Girl and loved it. The main character had a great voice. Second, I’ve met, Grace, the main character of Winging It! She’s been on my blog and I fell in love with her when she gave the most fun interview I’ve hosted on my site yet (And I’ve hosted some great interviews)! When you are done with this entry, you can read that awesome interview here. She Just Wants to Fly. Ever decided to do something that seemed like a good idea and in the second before there’s no turning back think, I musta been totally mental when I came up with this? And, then, Oh, well, here goes. That’s how Angel-In-Training Grace Lightbourne felt right before she asked the Big Kahuna to go straight to Earth on a mission as a Guardian Angel. The problem? She never was a great student and now she won’t even finish her last three years of school. The make matters worse, Archangel Michael isn’t happy about her special assignment, but Grace is convinced she’s on a fast track to her wings. How hard can it be? She’s working with humans, after all. Winging It!, the first book in the Angel-In-Training series, is an irreverent, light hearted take on Angels, Heaven and everthing else that’s divine. Loved it! Really loved it. It has a tween feel with elements of young adult, so I feel it will appeal to a wide age group. Grace is just as much fun as you might expect from the interview she gave on my blog. Though her disregard for her studies was a stressor for me (that’s my rule follower personality coming out), she learned lessons in her own way and occasionally came to it the old fashioned way – by cracking open a textbook. The supporting characters were fun and complex, too. I often found myself wondering about their motives and second-guessing their sincerity one minute and then routing for them and wanting to hug them the next. I’m very glad the INDIEpendence Day Blog Fest gave me the impetus to read this fun book. I look forward to the next in the series and am a bona fide fan of Shel Delisle’s. Brava, Ms. Delisle! Brava! Buy the book on Amazon. Now! Love Indies? 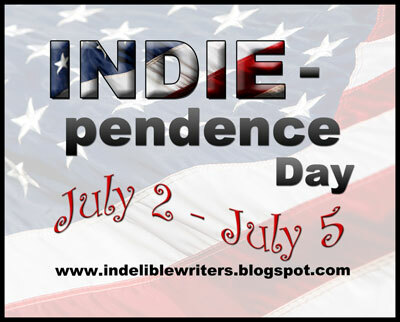 Be sure to visit the other bloggers who promise to highlight an indie published book. There are a lot of quality books out there from self published and small press published authors. Keep them writing by buying their books, liking them on Amazon and Barnes & Noble, posting a review and telling all of your friends! This sounds so cute! Definitely going on my list ... I bet my kids will love it too! It is very cute. Fun, clean read. Kai, I just came out of my writing cave to read mail and catch up on Twitter. What an awesome surprise!! Thanks for reading and it's wonderful to hear you enjoyed it. Glad you stuck your head out of your cave to find this. Hope it convinces people to buy it. Your characters are so much fun! Oh, that just sounds like pure fun! Thanks for sharing. That's exactly what it is! Thanks for stopping in Nicole! It sounds good, hope to win it.